Tomato fruitworms (Helicoverpa zea), also called corn earworms and cotton bollworms, are insects that attack tomatoes and other plants. 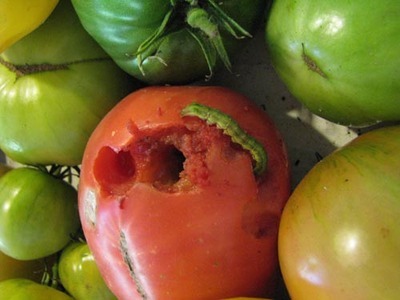 The fruitworm (in its larva form) attacks a tomato by tunneling. The tomato quickly decays and rots. Once tomatoes have been attacked by fruitworms, the fruit is no longer usable. Pick and discard them. The best way to deal with tomato fruitworms is to go on the offensive. What do they do to plants? They eat. Tomato fruitworms feed on leaves, stems, and fruit. They make holes. Worms (larvae) enter fruit, usually at the stem end, and can work their way through the entire tomato. The entry hole can be up to the size of a pea. They start green. Worms prefer green fruit. They leave a mess. Worms leave an interior hollow space filled with water, frass, decay, and rot. Fruit is inedible after a fruitworm infestation. What does the tomato fruitworm look like? What is the tomato fruitworm’s life cycle? Adult: a tan to brown-colored moth with a single dark spot in the center of each wing. Wingspan is 1 -1 ¼ inches. Adults emerge in the spring and lay eggs on tomato leaves. Egg: white or cream-colored, slightly flat, spherical-shaped, about the size of a pinhead. Eggs develop a brown or reddish stripe right before they hatch. Larva: light-colored caterpillars with a brown or dark-colored head and dark hairs. Worms can turn green, yellow, brown, red, or black. Stripes can run lengthwise on the worm’s back. Larvae feed on leaves, then fruit. Up to four generations can reproduce in a given season. Pupa: brown. They overwinter in the soil, generally in the top 2-3 inches. When do they do their work? Adults (moths) are nocturnal. They are most active in laying eggs at dusk. Larvae (worms) attack tomatoes just after fruit begins to set and grow, but before they ripen. They like green tomatoes! One way to find tomato fruitworms is to watch ripening If you discover one tomato that ripens considerably earlier than the others on a plant, check it for a fruitworm hole. They are greedy! Worms are cannibalistic and chase each other out of fruit. Each worm finishes growing inside a single tomato (unless fruit is small, in which case they may munch their way through several). Of course, that ruins the tomato or tomatoes. How can you control tomato fruitworms? Prevention is the most effective way to control worms (see below). Once larvae enter fruit, they cannot be treated directly, since they’re protected by the tomato’s exterior. But before that happens, you can take these precautions. Apply Bt: Bacillus thuringiensis (Bt), a microbial biological control, is considered to be very effective on fruitworms. Bt doesn't harm a majority of beneficial insects. It’s available in liquid, powder, and granules. Follow manufacturer’s directions for application. Treat plants with Bt in the afternoon or evening, since it breaks down in UV light. Apply Bt at the first sign of worm eggs. Once the pests hatch and ingest the chemical, they are paralyzed, unable to eat, and die. Apply oils. Use neem oil or insecticidal soap once a week and after rain. Apply other controls. Treat plants with Spinosad, a natural, broad-spectrum insecticide made from soil microbes. Or treat plants with the insecticide Sevin every 5-7 days when fruit begins to set (worms are untouchable once they get inside tomatoes). How can you prevent them from infesting your tomato patch? Monitor plants for eggs and hand pick leaves where eggs are laid. Adults lay eggs on both sides of tomato leaves, beginning closest to blossoms. Eliminating eggs reduces population dramatically. Prevent larvae from entering fruit by covering plants with fine netting. Encourage natural predators. Plant dill, parsley, and asters to attract parasitic Trichogramma wasps. Parasitic wasps can also be purchased and released into the garden. Big-eyed bugs, minute pirate bugs, lacewing, and damsel bugs also feed on tomato fruitworms. Plant goldenrod, daisies, alfalfa and stinging nettle to attract them. Till soil after harvest, in late winter, and in early spring to destroy pupae. How can you tell the difference between the tomato fruitworm and other tomato worms? The tomato hornworm is 3-4 inches long and bright green. The tomato pinworm is just 1/3 long (yellow, gray, or green) and has purple spots. What else is important to know about these pests? There are at least 15 other cultivated tomato fruitworm hosts in addition to the tomato, including corn, cotton, eggplant, okra, peppers, soybeans, and tobacco. Get more tips on our Tomato Pests Pinterest board.